Most patterns that you purchase will include the seam allowance, which means you don’t need to alter the pattern in any way. You just cut around the pattern and start sewing. However, if you are making your own pattern pieces or wish to alter an existing pattern…Then being able to add, remove, or adjust the seam allowance is an important skill to have! 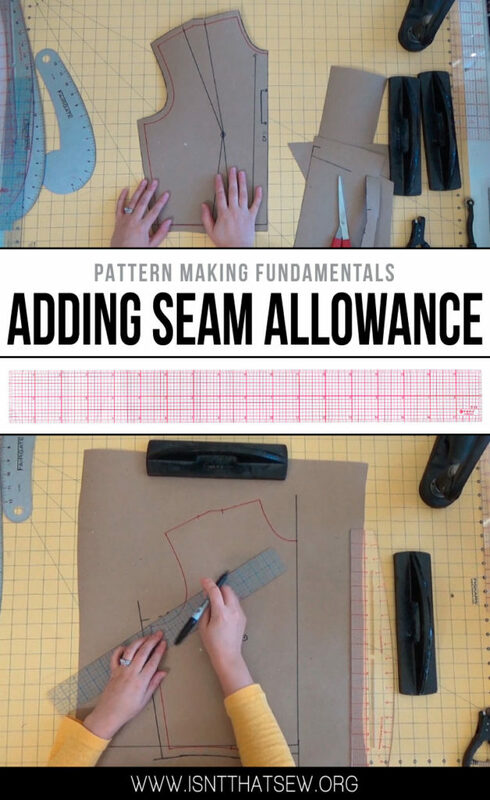 As a general rule most sewing patterns have the seam allowances included. If you are sewing with a pattern you have purchased please check your pattern before you start. You can add your seam allowances directly onto your fabric, but, personally…I prefer to add it directly to my pattern pieces. I’ll briefly discuss adding seam allowance to directly to your fabric below…But, I will not focus to closely on it…as I do not regularly add seam allowance in this way. If you choose not to add seam allowance to your patterns and prefer to add it directly to your fabric…you will place your pattern pieces on your fabric, leaving enough room between them to add the seam allowances. Decide what seam allowance you would like to add. If you are a beginner and not sure what to add, then refer to the loose rules above and to my post about understanding the ins and outs of seam allowance. Next, using a chalk, disappearing ink, or a double tracing wheel…add the seam allowance all around the pattern using your ruler and or tool of choice. Make sure to use pins or a weight to keep your pattern in place. If you only have a regular ruler, no problem. Just make a series of dashes and join them up. It can be a bit faster if you use a quilting ruler or a clear plastic ruler as you can draw longer lines at once. For curved parts, similarly make a series of small dashes and join them up. You can later blend and true those lines using a curved ruler or French curve to smooth out the lines. -Do not add seam allowance on a seam which is placed on the fold of the fabric. -Where you have a hem you may need to add extra seam allowance. Hems may need anywhere from 3/4 inch (2cm) to 2″ or more depending on the type of garment. Allowing more seam allowance lets you turn the hem twice. For example: once at 1/4 inch (6mm) then again at 1/2 inch(12mm). There are several tools to make marking your seam lines easier. A pattern master (or pattern maker) is a type of ruler used in pattern cutting that has lots of useful lines on it. They come in both metric and imperial measurements. A double tracing wheel has different holes to insert two adjustable tracing wheels into, letting you space them apart by the seam allowance measurement you want to use. This will work for both adding directly to fabric or pattern paper. The pattern notcher is a must have tool because it creates really clean markings for dart legs, sewing notches, arm hole notches, and more! The pattern notcher makes it really easy to mark your pattern and the notches hold up well over time! It’s no secret, this one’s my favorite! I guess I saved the best for last!!! Watch the video above and I go into detail on how to use this bad boy! I hope this post helped to clarify any questions you may have had for seam allowance…If I missed something, leave me a comment…. If you found this post helpful, please SHARE, COMMENT, and PIN! Disclosure: Please note that some or all of the links contained in this post are affiliate links, and at no additional cost to you, I might earn a commission if you decide to make a purchase. Read more here. Please know that I have experience with all of these products and I feel confident recommending them to you because I have found them to be the best tools of the trade!